Kerynn is the Owner + Creator of Tenth & Pine®. Having Stage 4 Endometriosis, Kerynn was given a less than 1% chance of ever conceiving naturally. Magically 10 years later, to her surprise she was pregnant! 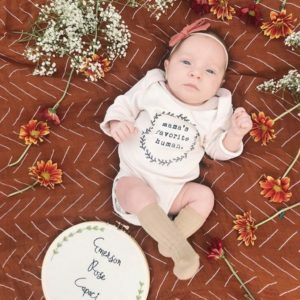 Once miracle baby Ezra Jade was born, Kerynn began loving all things baby; clothing, accessories, and anything unique that wasn’t easily found in stores. As a SAHM with a Masters in Business, she decided to create a shop that made it easier for anyone to buy for kids. 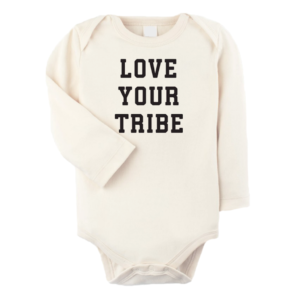 Tenth & Pine is changing the way you shop for Littles by creating gender neutral, USA made, organic, eco- friendly collections. No more searching boy/girl sections! You can find timeless pieces to pass down from one babe to the next, regardless if it’s a boy or girl! Tenth & Pine – Love Bug – 3-6 mos. 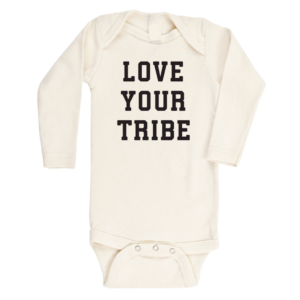 Tenth & Pine – Love Your Tribe – 3-6 mos.